Thank you to all of you for the nice feedback to my previous Secret Newsletter (you can join HERE http://eepurl.com/bMyVIf). The reception was actually such that I decided to start with the “Secrets” and finish with the “Commercials”. I shall make the answer to this most interesting question the topic of today’s Secret Newsletter. However, before we get “into the middle of things”, let’s agree on something: I’m fully aware that most of you who are reading this are amateurs (in the best sense of its Latin origin ”amare” – “to love”). Due to my books, which are now in eight languages, I have many people come up to me at magic conventions and say “thank you”, moments that are sometimes very touching. Or I join a group at a convention. And as the Vice President of my magic club in Basel, Switzerland, I’m quite active, too. In all of these cases I get to see a lot of magic, in 95% of the cases by amateurs. Nervousness. The first thing I notice is that most people get very nervous before and during the performance. Fear not, as this is something professionals suffer from, too. The difference, however, is that professionals know how to control the “beast”, but most amateurs don’t. I will mention three things. First, “stage fright” is a natural stress mechanism that helps us to be at our best in the extraordinary situation of a performance. Understanding this will turn the enemy into a friend. Second, we take ourselves too seriously. The higher we put ourselves, the longer the fall. Compared to the tragedies of life, failing in a card trick is, well, a minor incident. Therefore, relax. Third, find a ritual that involves mental and/or physical exercise before performing. Here is a simple one: Breathe in through your nose, and then breath out through your mouth twice as long. Do this for as long as it feels comfortable. The subject is obviously much more complex. This why I wrote an essay on the topic, “Who is Afraid of the Stage?”, and you can download it as a free PDF from my web shop by clicking HERE. If there is sufficient interest I shall make this the topic of my next Secret Newsletter – let me know. Secret Agenda (now available as an E-book). Make a resolution right NOW: do not ever again perform a trick that has not a well thought out presentation with a prologue and an epilogue. The Method is Not the Effect. Dai Vernon used to say that the difference between an amateur and a professional is that the latter knows what an effect is. This can go so far, that the method is mistaken for the effect. Amateurs have a tendency to judge the quality of a trick by its novelty and intriguing method. They derive their joy of practicing magic from the methods, not from the effect it has on a spectator. This is a huge topic. It requires an understanding of what the effect is and how to pull it off. It has to do with the order of actions (do I show the card has vanished from the deck and then reproduce it, or do I reproduce it, and then show it’s gone? ), the timing (where are the pauses? ), the text (what do I say, when do I shut up? ), how to structure the climax and several other things. Most amateurs I see perform are not aware that these questions even exist, let alone find a good solution to them. My Reality is Not Your Reality. A child puts his hands over his eyes and says, «You can’t see me!» He thinks that his reality is the same as the other person’s reality. Unfortunately this is not only the source of great aggravation in the world, but also in magic. It goes hand in hand with what I call the «Effect-Method-Split» (inspired by Karl Jaspers’s «Subject-Object-Split»). Some performers happily talk and perform, without ever wondering what the others are thinking and feeling at the same time. But since magic culminates in astonishment, and astonishment is the result of a mental process that eliminates all causes in order to access Wonderland, it is important to understand what happens in the spectator’s mind and how he (mis-)constructs his reality. This is the Constructivist’s approach to magic, and it is the approach of all good magic since its inception, but only in the 20th century was it formalized by the Spanish School of Magic. 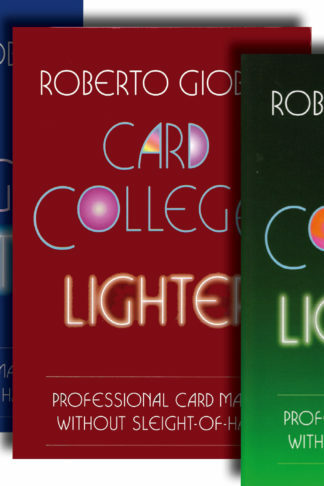 (Read Ascanio & Tamariz, but also the theory chapters in Card College 2 – it’s all there…). Bad Choice of Tricks. This is closely related to the previous two points. Amateurs get so fascinated by the novelty of a trick and its clever method, which at second look most of the time is not at all so clever, or by a novel gimmick, that they neglect to ask the all-important question, «What is the effect?» This, however, is one of the most difficult questions, not only for amateurs, I should add. Take «Chicago Opener» from Garcia’s Million Dollar Card Secrets, in spite of its controversy an excellent source for professional material. Most of us have done this trick, or are still doing it, rightly so, as it is a very good trick. But what is the effect? Is it a color change? Is it a prediction? Is it a manipulation of the spectator’s will? By understanding the phenomenon at the basis of the trick, the latter can be given the proper presentation, otherwise you risk to confuse the issue, if the given plot (presentation) runs against the inherent plot (contained within the trick). It is similar to when verbal and body language contradict each other, when someone says, «I do magic because I want to give people something», but at the same time they are making a «taking» gesture with both hands. A good trick can be told in one sentence, is memorable, its method impenetrable, and it has a clear subtext (symbolism). Always New Tricks. You’ve heard it before: «Amateurs perform always new tricks for the same audience, professionals perform always the same tricks for new audiences.» That’s the amateur’s dilemma (one of them…). 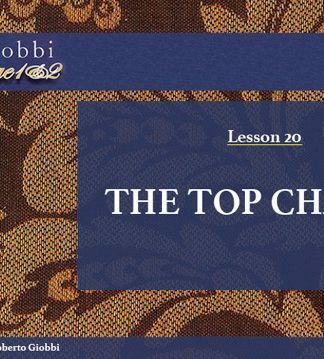 I answer the question in Ask Roberto in detail (Question 23 – «Practice», and Question 28 “Program Construction of an Act»), but here is a summary: try to keep three very good tricks in your «long-term-repertoire», and keep practicing them on a regular basis. Use 25% of your «magic time» for that. Use the remaining 75% for anything that «amuses» you, because, after all, as an amateur magic is a hobby for you, and you should simply enjoy it without any thought to utility. In those 25% of the time, you will do what you do better, and built criteria, which you will apply to the rest of your «novel» magic, and because of this, with the years, your magic will improve, and you will grow humanly and artistically with it. Communication, Timing & Pacing. 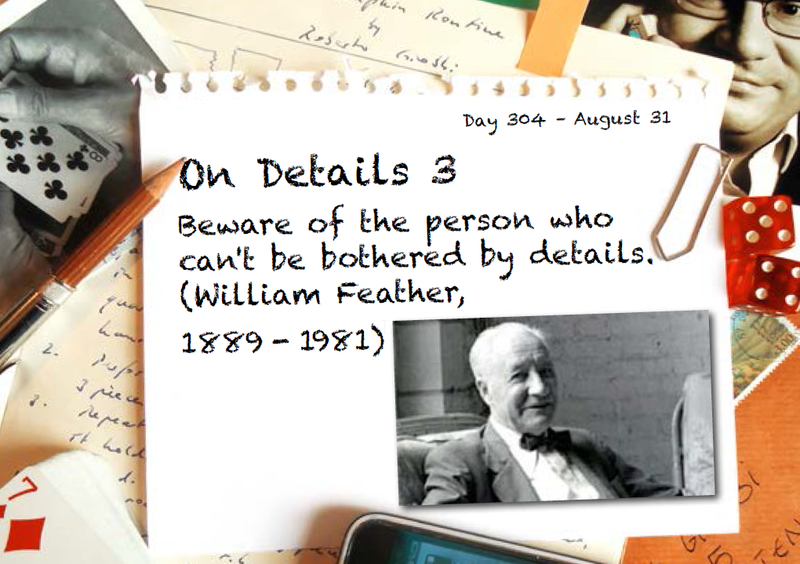 To look, when to look, where to look and how to look is one of the fundamental tools of communication and deception. Many do this intuitively, some do it well, most do not do it so well. There is a grammar of how to look, it is a language of its own (oh my, another lecture!). Very often, when I watch someone in an informal situation do several tricks in a row, they neglect what Ascanio called «the pause of assimilation». When an effect has occurred, you should wait for the effect to register; this means that the spectator has to go through a mental process, albeit a quick one, where he realizes that this is his card, that it is impossible that you could find it, that this is incredible, even impossible, that you are a genius (what else? ), and that he should tell and thank you. The amateur more often than not is more interested in showing off what he can do and knows, than to create the experience of wonder, to let the audience enjoy it, and to celebrate this moment of communion. Instead, he runs to perform the next trick, being afraid that otherwise he will miss the opportunity to do it. This also has to do with the lack of self-confidence that characterizes the inexperienced amateur, because he thinks that what he just did was not so good after all. BUT if one thinks this, why perform it in the first place? The solution is simple: only perform tricks that you feel comfortable with, because you think they are good tricks, and because you know you have mastered. If you don’t, practice more, and think. Read chapters 1 and 2 of my Stand-up Card Magic, as many of the problems mentioned are addressed in detail, with solutions of how to solve them. Read Chapter 27 «Theory» of Card College 2, for the same reason. Take one trick from your repertoire and implement only ONE new insight from the reading. Then take another trick, and implement ANOTHER insight. Do this with one trick per week, three in one month. Rest on the fourth week of the month. Do this for one year. At the end of the year notice your growth as a magician and human being, without effort and lots of pleasure – send me your thanks and a bottle of wine. If you are wealthy, send money to giobbi@bluewin.ch at Paypal. Since we spent so much time with the “mistakes” of others, let’s end with an exercise in humility and remember what Confucius once said: “If you see a worthy man, imitate him. If you see an unworthy man, examine yourself.” Amen. If you liked the answer to the above question, you will love Ask Roberto, available as a printed book, but also as an E-book. You’ll find 52 interesting questions and my detailed answers. Similar to Secret Agenda, Ask Robertois ideal to be read as an E-book on your Tablet or Smartphone. 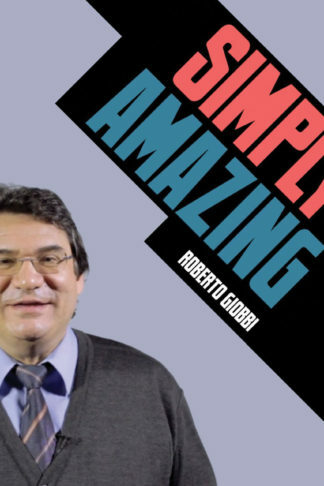 For the next 72 hours you can get Ask Roberto (the E-book) at 20% off HERE. If you’re still hesitating to get Card Magic Masterclass read Shiv Duggal’s rave review from Genii magazine HERE. 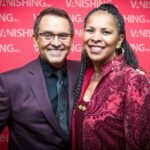 You can get Card Magic Masterclass as a download from Vanishing Inc. HERE, or a physical set from me HERE (ask me to autograph it to you). 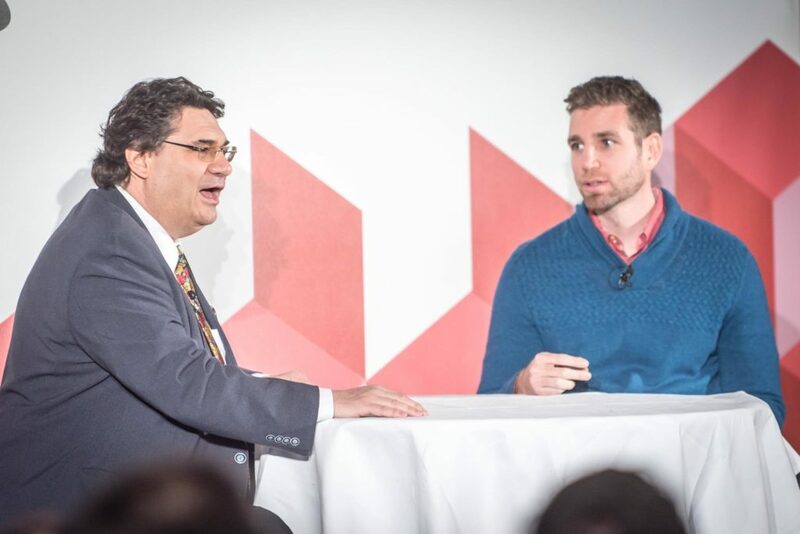 A piece of advice, if I may: when studying the videos, use a notebook (paper or app) to write down the items that interest you and the insights you’ve gained. If you do not do that, most will go in and out, and you’ve simply wasted you time. How to study, make notes, and practice is another subject for discussion, if you are interested. Confidences, one of my favorite books, is going to be out of print soon, and likely not reprinted. Get a signed copy as long as it lasts HERE. The 4-DVD-Set Card College 1&2 – Personal Instruction is now definitely gone and will never again be reproduced physically. BUT you can now download the complete course as MP4 files at a third of its original price (€ 49.95), and you can even have each one of the 23 Lessons individually at € 4.95. So if you are for instance struggling with the Palm or the Top Change, two of the more difficult sleights, get the two lessons for the price of a Starbucks Coffee. I kept the price as low as my dignity allows it and hope it discourages pirated versions. 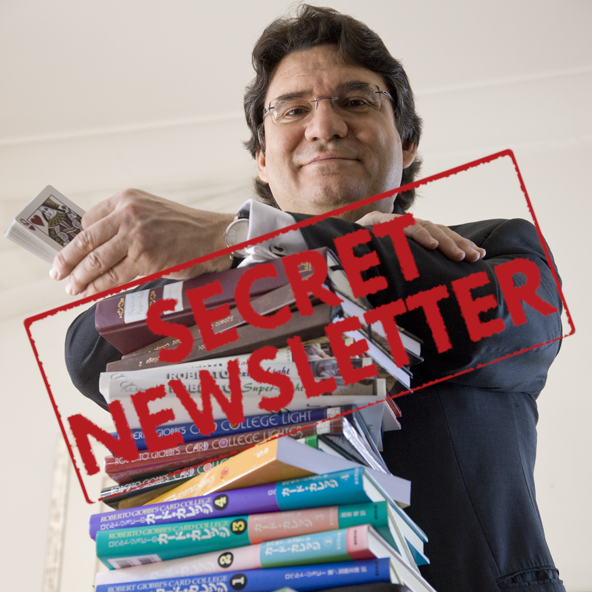 If you want to keep receiving my Secret Newsletter occasionally, make sure you have subscribed through my webshop HERE – simply enter your email address in the field and send. If you did not explicitly subscribe, this might be my last email to you. If you have received this mail twice, let me know by answering to this mail. More on the next occasion – so long! This is not a report of the convention, nor a critical review of individual acts, but simply a bunch of pleasant personal memories of a magic gathering I found most interesting. I’m not a native English speaker, the text has not been proof-read except by myself and Word’s spelling-checker, and everything is simply my personal opinion and not the fault of the people mentioned. The Session started as a small gathering focusing on close-up magic and founded by Andi Gladwin years ago. Meanwhile it is produced by Andi Gladwin and Joshua Jay, with their Vanishing Inc. team. It takes place at The Thistle Hotel, just off Heathrow’s Terminal 5. A bus takes you from all terminals to the hotel for a mere £5, and for the same price you can use a sort of monorail that takes you directly to the Thistle’s parking lot (do not take with heavy rain, as you’ll be soaked by the time you cross the parking lot). A taxi is £15 and takes about 15 minutes. Everyone would love this event to be in the heart of London, but nobody would want to pay the price this would cost. So this seems to be a good and cost-efficient solution. Also, hotel rates are cheap compared to those in London, and it is possible to survive on low-budget food, for those who need to, but there are a few other options, too. I like studying specific topics. I’ve done quite a bit of work on this myself, the Light-Trilogy or Art of Switching Decks are just that. The more you penetrate the world of magic, the more you realize that there are specialties, which in themselves are professions within the profession. I do no hesitate to compare this with music or medicine. To play the violin is another thing than playing the piano, and being a ophthalmologist is something else than being a cardiologist. So to be a mentalist is a different profession than to be a magician, but each can beget the other. This first day of The Session, co-produced with Luke Jermay, was entirely dedicated to mentalism. I missed half of it, as we were taping for a major project (we’ll let you know about this on a separate occasion). Even as an outsider to the topic you will soon realize that even a full day can only scratch the surface of the subject. But this is the idea. Michael Weber’s talk entitled “On Bob Cassidy Lecture” was such an instance. He performed several versions of the same trick, with different handlings and presentations, of which I found the last to be the most magical, but did not explain the method, rather encouraged people to read the book. Personally, I would have liked to know a bit more about Cassidy, the person. Max Maven delivered a talk about the history of the Center Tear, and I found this to be one of my favorites of the convention. Not only do you learn things about a specific subject, which you did not know before, you are also taught how to approach a subject, any subject, from a historical-biographical point of view. This leads to a better understanding of techniques, effects and presentations, but also gives you roots so essential to build competence and self-confidence, integral part of what Aristotle called “Ethos” in his rhetoric. Not many can pull this off in the erudite and elegant way Maven did, but this is one of the reasons we can safely consider him one of the few geniuses in our art. In the evening the Evasons did almost one hour as a solo event. They reminded me of what Paul Arden once said, “Good is better than original”. It was basically a Second Sight act, with several noteworthy additional effects, but all done with consummate professionalism. Although almost all in magic know about the basic principle, the Evasons managed to fool the knowledgeable audience in several instances. It was a great lesson in how to take a classic, and by devoting your life to it bring it to heights that are rarely attained. But, frankly, one couldn’t care less about all this, because they succeeded in giving their audience the present of a uniquely magical experience, and that’s what it is all about. Two standing ovations were the least the audience could then give back. The day started at 11am, which proves that the organizers are professional magicians. Most conventions are run by magic amateurs, and it shows with starting times around 8 or 9. But performing magicians mostly work late in the evening, and are thus more like firemen or surgeons serving on night shifts, so they cannot be expected to get up at 6 like people who work in an office. The first event was a Session proper, with several presenters, which were given a time slot of ca. 20 minutes. I do like the idea of having a series of presentations done in front of a plenum, rather than the traditional magic convention format, where various events take place in different rooms, mostly overlapping in time. The format used at the Session is reminiscent of a scientific symposium, and in my opinion allows for the topics to be better appreciated. Of course there is still a difference, for only few of the conventioneers are professional magicians, unlike an engineers or doctors convention, where all are engineers or doctors. But that, as we all know, has some other advantages. A subject we leave for a longer essay. Since I was waiting backstage to go on later with Joshua Jay, I saw the presenters only from the side or on the backstage screen. Ponta the Smith was very successful with his presentation on coin magic. It reminded me of the interview Truffaut did with Hitchcock, were the Master was asked about innovation in film. A the time his reply surprised me greatly (it wouldn’t now, after having been into magic for a few decades), as he said that there are no new basic plots in movies (as there aren’t in theatre or literature), but the technology has greatly improved. As an example he mentioned rear projection, which in older films is blatantly obvious, while nowadays completely new technologies can make almost anything look absolutely realistic. Well, the effects Ponta did, were coin assemblies with variations, well-known plots, but done with incredible skill and a few new techniques and gimmicks. Another subject to reflect upon. I greatly liked Adam Rubin’s talk on how to take optical illusions and turn them into three-dimensional magic objects. Everything was surprising and innovative. This is definitively a talk more people should have a chance to witness, as it touches upon subjects we are not usually exposed to at magic conventions. I missed the next two lectures, as I had still to recover from three full days of taping, but later attended Paul Vigil’s show, which he repeated several times. Vigil has made himself quite a reputation with some well-written publications of professional caliber, but only few have seen him perform, at least not in Europe. Dai Vernon came to mind, who once said, “The difference between an amateur and a professional is that the latter knows what an effect is”. Irrespective of whether you agree or not with his choices, Vigil has a sharp mind and has clinically analyzed every piece he does, and he brings them over with likeability and competence. In the show I attended he missed on a few occasions, but nobody took exception to it, proving Leipzig’s adage that “people love to be fooled by a gentleman”. A group of us, made up of Guy Hollingworth, Max Maven, Tim Trono, Joe Gallant and myself decided to jump the next two events in favor of a civilized dinner at «The Estate Grill» at Great Fosters Hotel. It’s a short taxi ride, and for the price of an unnecessary DVD and a few collector decks that can never be used in a real-life-performance, we were wined and dined at an unexpected gastronomical level. I’ve said it before, and I’ll be happy to repeat it here: gastronomy is the basis of all good magic. Because gastronomy has to do with eating, if you don’t eat you die, and if you’re dead you cannot do any good magic. Ergo gastronomy is the basis of all good magic. – q.e.d. We made it back to Adam Rubin’s show, which was definitively targeted at a younger New York audience that was not present. But Adam is an authentic performer with an obvious and serious love for magic, which he puts across with much enthusiasm. The first function I was able to attend on this day was Ondrej Psenicka’s lecture. He is the creator of the Butterfly Deck, which was designed by his friend Stefan Eriksson who came on stage to briefly give his side of the story. They met at a magic course given at the University of Stockholm by Tom Stone. In my own lectures, workshops and full-day seminars I keep saying that one of the great benefits of such events are the new friendships you make with like-minded people. Ondrej and Stefan are a paramount example of this. Ondrey has taken the edge-mark principle to the nth degree and combined it with other marking systems, resulting in his unique Butterfly Deck. Obviously working with such a deck is a specialty in magic, similar to working with threads, a memorized deck or a thumb writer; you have to dedicate weeks, months and maybe more to be able to tap into the full potential of the instrument. But regardless of whether you will ever use this, this lecture was inspirational and practical on many levels. The care Ondrej gave to the didactical aspects of the lecture is something one rarely sees. If you want to know more, get his deck and the beautifully produced book The Secret of the Butterflies. Here is a man to watch with a grand future. One of the highlights of this year’s Session was certainly the Johnny Thompson Event. Tomsoni, without the Co., was capably interviewed by Michael Close and Paul Vigil, although the hosts only needed to mention a term that immediately served the legendary Tomsoni as a trigger. The audience was treated to some amusing and insightful anecdotes, much wisdom from an internationally working top pro, and last but by no means least to some absolutely wonderful performance pieces. It is hard to pick a favorite, but seeing Thompson do the Egg Bag restores your belief in the classics of magic. I’ve seen several world-class performers do the Egg Bag, but I like this best of all. He left everyone wanting more. The book about his life and magic, The Magic of Johnny Thompson, which is a two-volume publication, can be pre-ordered from www.magicana.com – I did. The Session was closed by a “Gala Show” and featured a mix of acts that were hand-picked by Andi & Josh. Like most “Galas” at magic conventions it lacked the unity of a stage production, but was amply compensated by the feeling that you are part of a family affair, where the hosts want you to share their enthusiasm for their passion. This is not to say that there were no professional standards applied to the event in general and to this closing show in particular. Quite the contrary is true: every year they change and add little and big things, and if they now bring up the stage another ten inches or so, it should be as perfect as one can get in a location, where you have to bring in everything. I greatly applaud their effort to bring fresh and new faces to be discovered by an enthusiastic and hungry crowd. But they also know how to combine this with solid and proven elements. Danny Buckler, to whom comedy comes as easy as breathing to others, conducted the final gala. As a non-native speaker of English many of his ad-libs and funny bits were lost on me, but the natives howled, and he had the audience in the palm of his hand within the first minute. The acts he capably introduced were all interesting in their own way and it would take more space than I allow myself to do justice to all of them. So I will simply mention my fellow countryman Pierric, whose original act, with which he won the Grand Prix at the FISM 2015 in Rimini, was received with great enthusiasm. As every night, the last function was not the last at all. During the three nights of the convention the Thistle Hotel offered three areas for late night activities: a fairly large lobby area next to the reception, a windy bar with view of Heathrow’s runway, and a downstairs area, which could use a few tables more to accommodate all those who were eager to session, cards, coins and what-have-you in hands. Remembering from my time as a student in London and Cambridge that virtually all pubs across the Kingdom were forced (Classic or Riffle?) to close at 11pm, when in Spain people go to dinner, something similar to English Humor only the natives understand, the organizers must be praised for convincing the hotel management to keep the bar open until late. Of course this is common business sense, as from the proceedings they have probably bought a new private jet. The food & beverage manager in charge of buying the wine for the bar on the lower floor, though, must be a beer drinker… And if they were to use glassware instead of cheap plastic cups, they might even double their business, at least from me. I refuse to drink from plastic cups (when I have to pay), which is like going to the opera with earplugs. Conventioneers received two decks of cards as a gift, one being a special The Session deck, which should make many a collector happy. And all were given a beautiful Moleskine-type of notebook, which encouraged taking notes. That was amazing in an age of all-digital, and I’m all for it. How to take notes and manage them is one of the questions I’m often asked, but we will have to leave that subject for another occasion. 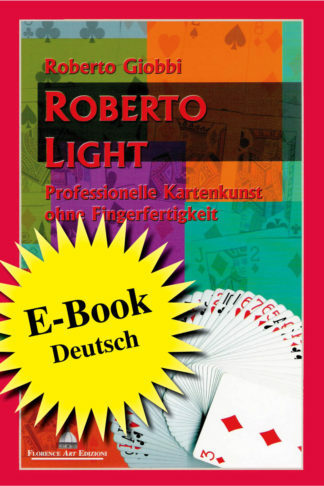 I did though treat the subject in at least two places, one, in Card College Volume 2, p. 476 “The Study of Card Conjuring”, two, in Ask Roberto where I have dealt with the question in several essays. Also, I have a talk on “How to Manage Notes With Evernote”, which I’d love to give at a magic convention one day, but most organizers think this is not of interest, whereas I believe the contrary to be true. I grew up at a time where magazines, club meetings and conventions were a major complement to books and personal tuition. The digital revolution with Internet and globalization has brought a lot of changes and shifts, but an event like The Session proves beyond the shadow of a doubt, that real human beings getting together to celebrate magic and life cannot be replaced by any virtual world, yet. When I was young and naive, I innocently approached many of the greats in our art, most of whom where very kind to me and encouraged my obvious enthusiasm. 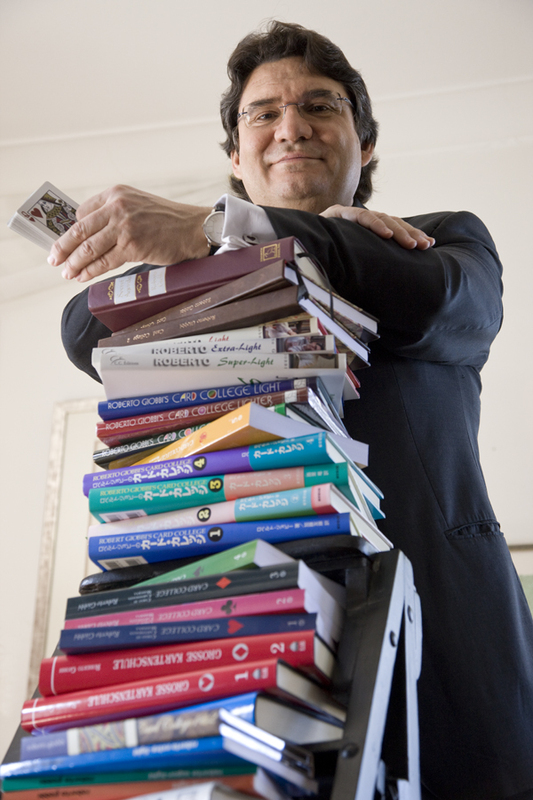 Now, after over 80 books including their translation into eight languages, many youngsters in magic who tell me they started their hobby or even professional career with one or several of my books approach me. I’m very much humbled by this, and remember Schopenhauer, who once wrote, “Meine Philosophie hat mir nie etwas eingebracht, aber sie hat mir vieles erspart”, which I like to translate with, “My philosophy has never earned me much, but it has saved me a lot.” It’s somewhat nice to be approached by Dynamo in London, who thanks me for a trick he’s doing from my Light Trilogy, or to go to Las Vegas and be approached by Penn & Teller after their show in the lobby, saying, “Hey, you must be Roberto Giobbi, we read your column in Genii!” This greatly compensates for the frustration of receiving only $4.40 from a book that costs $55. In closing, if you have read up to here, and have not been to the convention itself, I can whole-heartedly recommend that you come to the next The Session, which will take place in January 2019, details soon to be announced here https://www.sessionconvention.com. I plan on being there, as I have in the past few years. By all means come up and say ‘Hello’, and show me your latest trick. 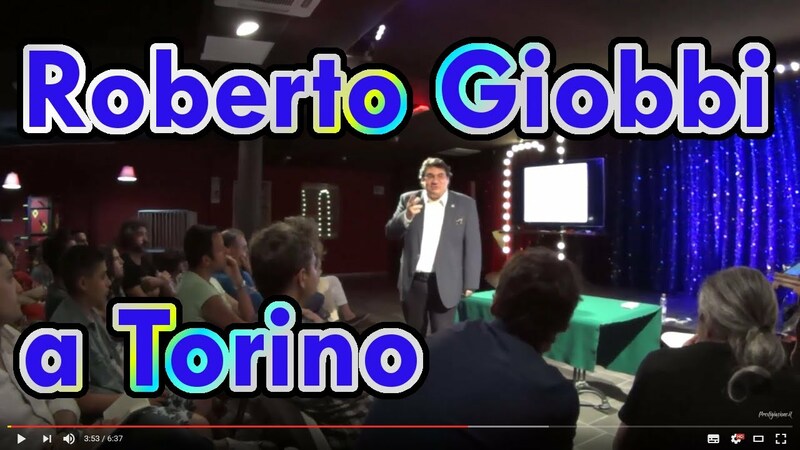 From the italian website Prestigiazione.it, a video of a recent visit and lecture to the beautiful new seat of the italian magic club Circolo Amici della Magia, Torino, Italy. On October 11th 2017, I will be the lecturer on mentalism and playing cards. 16/06/2047, Torino Roberto Giobbi, autore del famoso Card College, Bibbia della Cartomagia, parla delle sue Agende al CADM di Torino. From Secret Twitter August 31st. 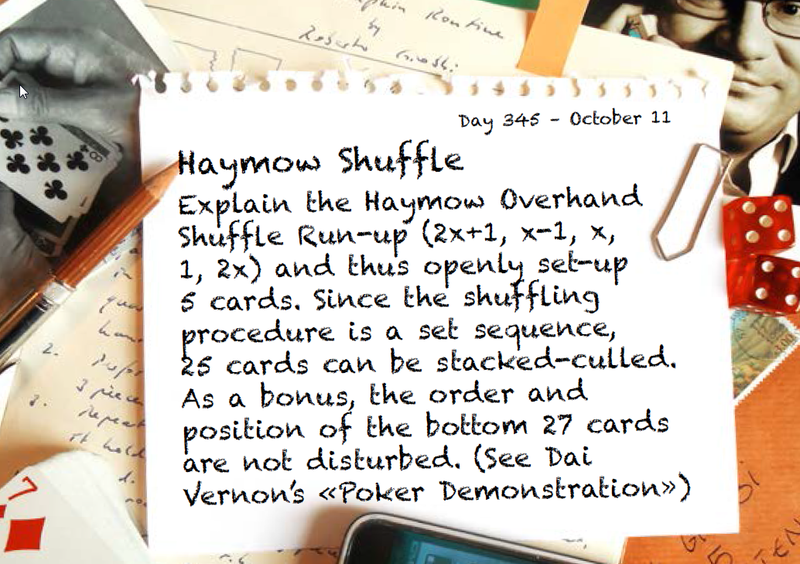 Explain the Haymow Overhand Shuffle Run-up (2x+1, x-1, x, 1, 2x) and thus openly set-up 5 cards. Since the shuffling procedure is a set sequence, 25 cards can be stacked-culled. As a bonus, the order and position of the bottom 27 cards are not disturbed. You can get Secret Twitter at this link. From Secret Twitter June 20. The opposite of boring magic is fascinating magic. 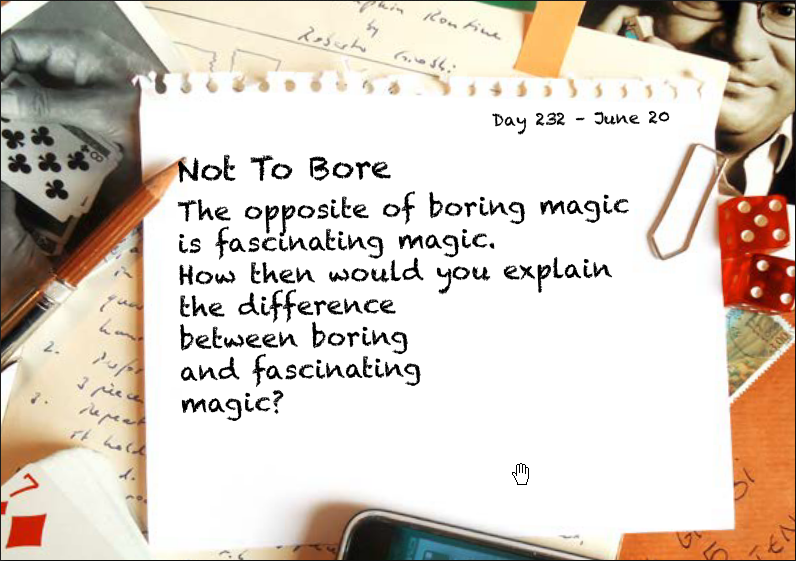 How then would you explain the difference between boring and fascinating magic? 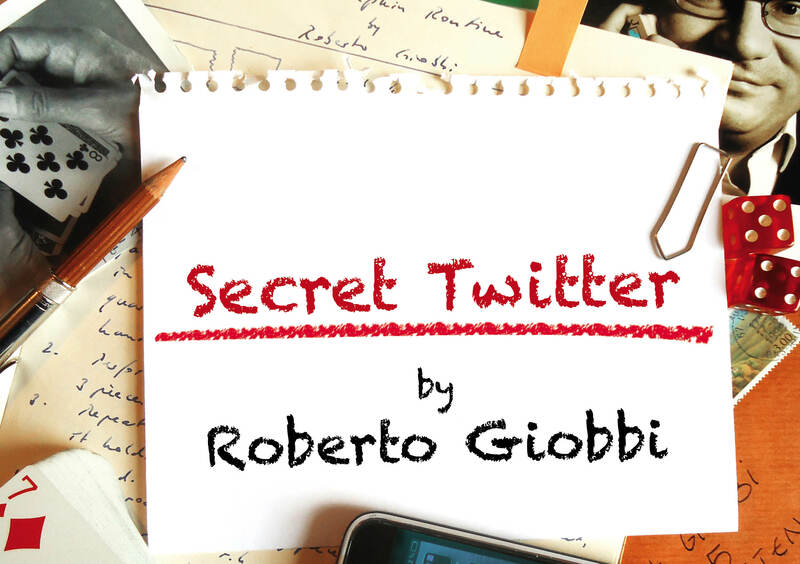 Secret Twitter di Roberto Giobbi e’ stato un esperimento curioso… Se non lo conoscete leggete questo articolo. 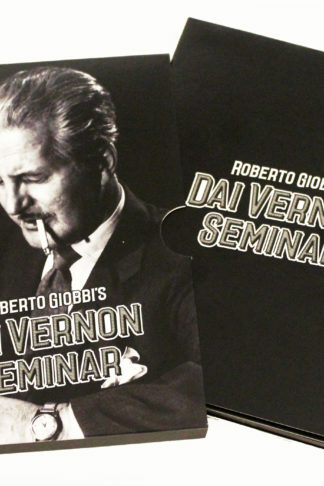 In breve si tratta di una versione “social”, dei due libri Secret Agenda e Hidden Agenda. Quello che mi affascina della Magia non e’ il “metodo”, il trucchetto, il meccanismo tecnico con cui si esegue un effetto, ma principalmente il “Pensiero Magico”, la Storia, i ragionamenti che vengono sviluppati e rendono il metodo un effetto, una vera Magia. Ci sono tantissimi artisti e studiosi che hanno un Pensiero Magico bello e completo, che con una parola, una riflessione, non strettamente inerente alla Magia, riescono ad far scoccare una scintilla nei nostri ragionamenti, aiutandoci a comprendere meglio la Magia ed a rendere più forti ed emozionanti le nostre esibizioni. Un po come “101 Storie Zen“, se mi permettete l’accostamento, dove attraverso aneddoti si cercano di spiegare concetti molto profondi. Roberto Giobbi e’ uno di questi artisti, e nel suo Secret Twitter, ancora una volta, lo ha dimostrato. In ben 426 Tweet, uno al giorno, ha dato una gigantesca mole di informazioni, concetti, idee per creare un proprio Pensiero Magico.